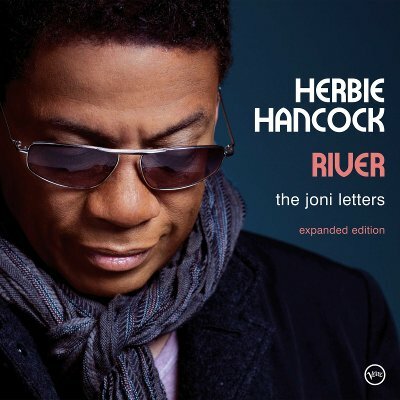 When Herbie Hancock's genre-defying River: The Joni Letters, won the 2007 Grammy Award for "Album of the Year," beating out Kanye West, Amy Winehouse, Foo Fighters and Vince Gill, it was a victory for musical exploration, inspired musicianship and the kind of creative spirit that the legendary jazz musician has carried throughout his incredible and influential five-decade career. A true milestone, the album was only the second jazz recording to win the top honors in the award's history, with the first being Getz/Gilberto by Stan Getzand and João Gilberto in 1965, 43 years prior. The musical tribute to the iconic Joni Mitchell, which also won "Best Contemporary Jazz Album," soared up the charts where it peaked at number 5 on the Billboard 200. In celebration of the album's first decade anniversary, River: The Joni Letters, will be released as a 2-CD expanded edition with four bonus tracks on December 15 via Verve Records/UMe with the digital release to follow on December 29. Last month, the album was released on vinyl for the first time in the U.S. Upon release, River was hailed by critics for Hancock's thoughtful interpretations of Mitchell's compositions, which he used as a jumping off point for extended musical meditations. The New York Times declared it "an intimate reinvention issuing from someplace deep inside the music" while NPR remarked, "Hancock is too smart to follow the tribute-record script. He doesn't radically overhaul Mitchell's songs. Instead, he gently opens them up and lures the singers into fascinating free-associative conversations." New York enthused, "Hancock comes to these songs with uncommon sensitivity and understanding," adding, he "came of age when pop and jazz overlapped comfortably, and he's at his best when he shows us how they still can." Hancock first worked with Mitchell on the acclaimed singer/songwriter's Mingus record, an album comprised of collaborations between Mitchell and the great bassist and composer Charles Mingus. Together with Wayne Shorter, Hancock was part of the ensemble with which Mitchell tried to craft a new "conversational" approach to coupling lyrics with instrumental jazz. "At this point in my career," Hancock said when the album was announced, "I want to do something that reaches into the lives and hearts of people." With River, he did just that. Hancock enlisted producer/arranger/bassist Larry Klein (a frequent producer and collaborator of Mitchell's), to help him go deeply into Mitchell's body of work to select songs that they could adapt to a genre-less and conversational musical approach, while trying to portray the breadth of Mitchell's gift as a musician and writer. To add another dimension to their picture of Mitchell's musical world, they also included two compositions that were important to her musical development, Shorter's asymmetrical masterpiece "Nefertiti," first recorded by Hancock and Shorter on Miles Davis' classic album of the same name, and Duke Ellington's prescient standard "Solitude." Hancock and Klein worked for months, carefully reading through Mitchell's lyrics and music, eventually paring their list down to thirteen songs that they hoped comprised a panoramic view of the poet's work. They then assembled a group of the top musicians in the world, including the incomparable Shorter on soprano and tenor sax, the brilliant bassist and composer Dave Holland, (a musical cohort of Hancock and Shorter's who shared their adventurousness, as well as the Miles Davis imprimatur), drummer Vinnie Colaiuta (a then-recent member of Hancock's band as well as having played extensively with Mitchell and Sting), and Benin-born guitarist Lionel Loueke, also a member of Hancock's band. They went on to craft arrangements for songs like the often recorded "Both Sides Now," and "Sweet Bird" (from Mitchell's overlooked classic The Hissing of Summer Lawns) that transformed the songs into lyrical and elegant instrumental tone poems, devoid of the trappings of conventional jazz records. "We wanted to create a new vocabulary, a new way of speaking in a musical sense," Hancock said. Klein added, "We used the words to guide us. All of the music emanated from the poetry." They were also fortunate to be able to cast the vocal songs with some of the greatest singers in the music world. Mitchell herself sings the autobiographical musing on childhood "The Tea Leaf Prophecy," Tina Turner turns the beautiful prose of "Edith And The Kingpin" into a timeless piece of song-noir, Norah Jones delivers the wistful classic "Court and Spark," Corinne Bailey Rae turns the mournful Christmas classic "River" into an innocent and optimistic poem of bittersweet romance, Brazilian-born Luciana Souza becomes a dark third voice to Hancock and Shorter on "Amelia,"and in a stark and cinematic closer, Leonard Cohen recites the brilliant and surreal lyric to "The Jungle Line" as Hancock provides film score-like improvised accompaniment. The 10th anniversary edition of River adds four additional songs of Mitchells', previously released as Amazon and iTunes exclusives. The extra tracks span Mitchell's expansive career and include "A Case Of You" and "All I Want" (featuring Sonya Kitchell) from her masterpiece Blue, "Harlem In Havana" from her 1998 album Taming The Tiger and "I Had A King," the opening song on Mitchell's debut record Song To A Seagull. "Harlem In Havana" and "I Had A King" are making their debut in any physical format. River: The Joni Letters represented a journey into a new world in Hancock's search for fresh ground – a world of words – and now with this new expanded release fans can revisit this stunning album again and dive even deeper into Hancock and Mitchell's timeless creations.